This week's guest editor is JJ Goode, the writer behind Andy Ricker's new cookbook, Pok Pok. All week, he'll be sharing some of his favorite recipes from the book, interviewing Andy about Thai cooking, and convincing us all to pick up a book and get in the kitchen. Today: Build up the courage to cook a whole fish -- bones and all. I’ve never been afraid of eating whole fish -- I don’t mind dodging bones or scouring the face for tasty bits. I will admit, however, to a fear of cooking one. The stakes involved are intimidatingly high: A whole fish looks so pretty and can be pricey -- I’m scared of screwing it up! Yet I’ve found the confidence thanks to Andy. 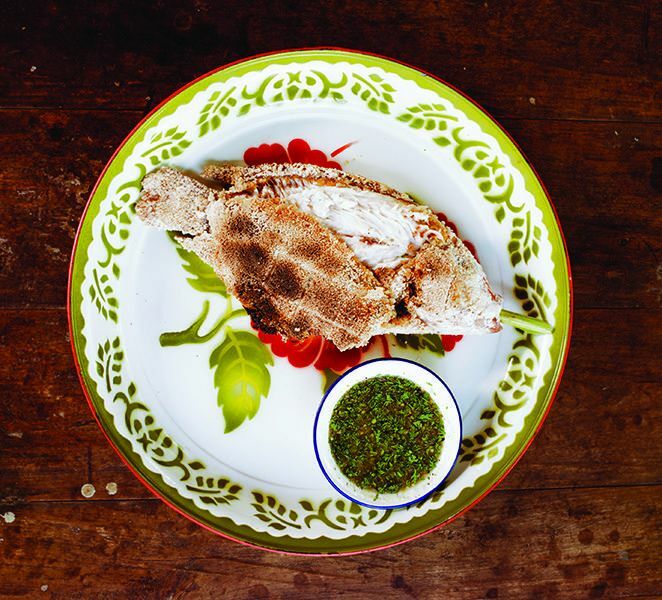 During the last year, I’ve served my friends several whole fish dishes from his cookbook. I’ve made steamed striped bass with chiles and lime, and with soy sauce, ginger, and oyster mushrooms. (The basic method: Put fish on plate, pour on simple mixture of stuff, and steam.) I even got up the courage to lower porgy into hot oil, though it took no gumption to spoon over sweet-sour chile sauce just before serving it. Of all the preparations Andy taught me, this is the one I make the most. It helps that it doesn’t require deep frying or hauling out my giant aluminum steamer. But the main reason I keep returning to it is that the salt crust keeps the flesh so moist that my big worry (will I overcook my beautiful fish?) is out the window. Further insurance against disappointment comes in the form of a chile-based dipping sauce so good that it could make an old shoe worth eating. Reprinted with permission from Pok Pok by Andy Ricker with J.J. Goode, copyright © 2013. Published by Ten Speed Press, a division of Random House, Inc. I help chefs write cookbooks! I’ve co-authored several, including Pok Pok: Food and Stories from the Streets, Homes, and Roadside Restaurants of Thailand (Ten Speed) with Andy Ricker, A Girl and Her Pig (Ecco) with April Bloomfield, and Truly Mexican and Tacos, Tortas, and Tamales (Wiley) with Roberto Santibanez. I got the book last week, and I can't wait to try these recipes! Wooo! So happy to hear that Nicole! If you're interested, I can send you a little list of my favorite medium and hard recipes. They take a little more effort but pay off big time! I would LOVE that! I'll message you my email! Fun! I'll email you right now! You must from now on! It should forever join verbs like barbecue and deep fry.